Have you ever put everything you had into writing guest posts, only for them to fall flat? You look at your analytics and wait for the hordes of visitors to arrive. Weeks later, and your guest blogging efforts have failed to gain any traction. The problem with guest blogging is that it isn’t a magic bullet for blog growth. And some of your guest posts will fade into obscurity, only to gather dust on someone else’s blog. But the truth is that it doesn’t have to be that way. Today, I’ll show you how to gain a competitive advantage over other guest bloggers that are vying for the same attention that you are. You’ll learn how to make your content stand out, how to choose the right sites to contribute to and how to get more clients. You’ll also learn 4 blog post types that will dramatically increase your visibility. Guest blogging is hard work, right?! It takes time, effort, dedication and a smart strategy to make the magic happen. And that doesn’t mean you should throw in the towel. It’s easy to write a few guest posts and quickly jump to the conclusion that you’ve wasted your time. Why didn’t it work? And how can I adjust my approach to make it work? So what happens when you get your guest blogging strategy right? Guest blogging took Buffer from 0 to 100,000 customers, but what about those of us that aren’t running a software company? Elna Cain went from 0 to a full-time freelance writing income, while only working part-time. And that happened in less than a year, partly thanks to writing guest posts for free. And back when we first launched UK Linkology a few years ago, I spent a few days writing for other blogs each month. The result? We hit 5 figures per month in roughly 5 months, mostly due to guest posting on the sites that our target customers visited. These sites didn’t send us much traffic, but they did send us super engaged visitors that eventually became clients, who stayed with us for a long time. (Note: UK Linkology is the agency I used to work at, and left to focus on blogging full-time, then returned as a co-founder last year). Now you know what can happen when guest blogging is done right, let’s take a closer look at exactly what you need to do to make the magic happen! Some of these tips are quick to implement, and others take more time & some additional tools. But all of them will help you create a stellar strategy to take your guest posting efforts to the next level. The majority of blogs you could contribute to aren’t worth your time because they don’t have an engaged audience. So how do you find blogs worth contributing to? Do they have an engaged audience? Comments are a great indicator but pay close attention to quality – a load of spam comments are a red flag. Do they reply to comments? This is a sign that the blog owner cares about engaging with their audience, and the blog is active. Do they adequately share their own content? If they don’t put time into sharing their own content, they probably won’t spend much time sharing yours. Does my ideal audience align with this blog? You need to have an “ideal audience” that you want to reach, and the blogs you contribute to should speak to that same audience. Do they give writers credit & a link to their blog/landing page in an author bio? You’ll put a lot of effort into writing content, so the least you should get is a byline with a link back to your site. Do they have the potential to drive traffic or are there too many distractions? Too many distractions may mean they won’t refer as much traffic as a blog with an ultra-clean layout. Some of these sites are still worth contributing to because they have engaged audiences and provide great social proof. Sure they’ll send you less traffic, but the quality is important too. Initially, you may find that you need to contribute to smaller blogs. Because larger blogs sometimes ask for samples of posts you’ve written for other sites. In your author bio, you should always link to a landing page where readers can download your lead magnet. Or if you have multiple lead magnets, use whichever is the most relevant. The main link goes to this landing page, where readers can download all of the checklists and guides I offer for free to my subscribers. 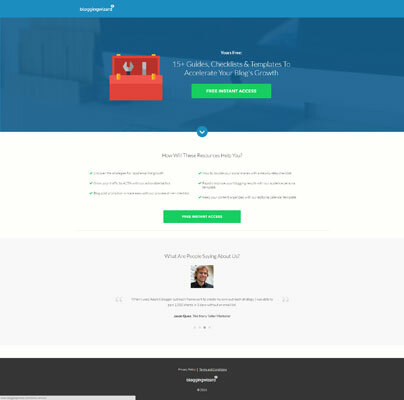 I used LeadPages to create this landing page – and it didn’t take long to do (LeadPages is a paid service that requires a monthly payment). Although there are a bunch of other tools you can use for this, check out my post on landing page plugins for WordPress to learn more. So what about your lead magnet? The best lead magnets tend to be the ones that solve specific problems. Mine is fairly broad, but I’ve gone more for overall value. Do you need to write a huge ebook or create 15+ guides? Nope! You could do a checklist, template, a collection of resources or something else. Once it’s ready, you can host it using a tool like Dropbox. Then make it easy for your subscribers to access download by adding a link to your confirmation page & your welcome email. Sue Anne Dunlevie wrote a great post outlining all you need to grow your list using guest blogging – find the post here. Blog editors get countless pitches from people they don’t know. So your pitch could be the best in the world, but it’s no guarantee that you’ll land that guest posting opportunity. Well, a great pitch helps, don’t get me wrong. But wouldn’t you want to do everything you could to land that opportunity? People are far more likely to respond in a positive way to folks they recognize. These are just the basics, and if you’re trying to connect with A-listers in your niche, you’ll need to get creative. Ana Hoffman’s post on “11 Memorable Ways To Gain An Influencer’s Attention” is a great place to start. But more often than not, the best way to connect with someone is to get in their inbox as Jason Quey discusses in his post on influencer marketing lessons. For some, this can be as straightforward as engaging in a conversation by replying to a blogger’s email newsletter. Don’t ask them to do anything, or pitch them – just engage them in conversation. This is exactly how Ryan Biddulph of Blogging From Paradise first connected with Chris Brogan. And it led to all sorts of good stuff like testimonials and shares of his products. The other reason why connecting first is a good idea is because it forces you to get to know the blogger that you’ll eventually pitch. You’ll gain a deeper understanding of the types of topics they publish and how they write. So, you can use all of this understanding that you’ve built up when you eventually send them a pitch. And when you eventually write your pitch – it will be far better. When you are ready to pitch, I recommend you check out this post by Karol K. He interviewed 11 blog editors about the best pitches they’ve ever received and pulled out some solid conclusions. To a lot of us, this has become almost second nature by now. But it’s essential because when someone has taken the time to leave a meaningful comment, it’s only right to reply if only to thank them. Better yet, add to the discussion and keep it going. Even if you end up contributing to a blog where the owner doesn’t respond to comments – you should. Blog comments are a great way to learn from your readers, gain feedback and get to know them better. When it comes to publishing guest posts, one of my pet peeves is when the guest blogger doesn’t reply to comments. If that happens, they won’t get another opportunity to contribute to my blog. Don’t just leave it up to the blogger to drive all of the traffic to your post, or share it on Twitter once and think that’s enough. Because that isn’t enough to get the results you want. I’ve seen some bloggers land a great guest blogging opportunity and barely promote their post at all. And sure, the whole idea of guest blogging is to help you reach a larger audience. But when you contribute a post to a more popular blog, your usual promotional efforts will have a far larger impact. So leverage every promotional strategy you can – your personal network, influence marketing, niche bookmarking sites, email outreach, social media and all the usual stuff. 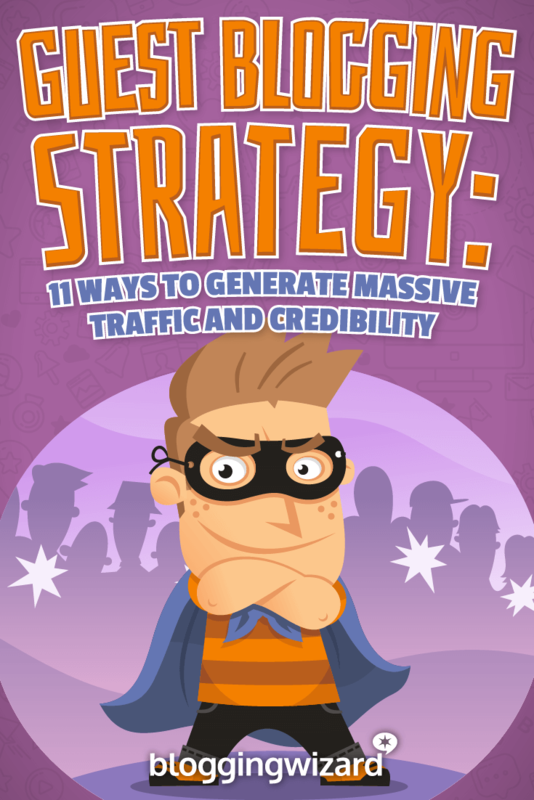 Check out my big traffic generation tips post and put together your own promotional checklist. There will probably be some niche specific tactics you can use too. And be sure to consider promotion while you’re planning your guest posts, even when you’re coming up with topic ideas to pitch. You could also try searching the blog’s URL in a tool like Buzzsumo to get an idea of which topics get the most shares. Your guest post will show your author bio below it, so you need to make sure it sends the right message. For example, if you’re trying to get freelance writing clients and you don’t mention it in your bio, you’ll struggle to land new clients. I’ve hired a lot of writers for various projects over the years, and one of the main ways I’ve found them is because I’ve read a few of their posts first, and spotted that they offer freelance writing services in their author bio. Immediately you can see that David offers freelance writing services, and he caters to solopreneurs & small businesses. He mentions WHO he can help, HOW he can help them, and his specialty for good measure. Tom runs his own startup, and you can immediately identify the WHO and the HOW. There’s also a very compelling call to action which goes to a landing page to build his email list. Your author bio should always be guided by your end goal. If you want to get more writing clients, your bio should reflect that. And if you just want to build your email list – it should reflect that too. But however you position your bio, always make sure you’re telling people WHO you can help and HOW you can help them. Be clear and be succinct. Tip #7 – Guest post more! The unfortunate truth is that while you can meticulously plan each guest post you publish to ensure the best chance of it generating serious traffic – some posts just fall flat. Maybe the topic didn’t resonate with that blog’s readers, or it was something else. It’s not the end of the world; you still have a great guest post that can unlock other opportunities. For example, one of my guest posts on Problogger didn’t drive much traffic. But it led to Jon Morrow inviting me to write for SmartBlogger (formerly Boost Blog Traffic). That Problogger post drove around 20 or so visitors, but not all posts are made equally because another sent around 200 visitors. Another thing I’ve noticed over the years is that the impact of guest blogging compounds. So, if you make sure a bunch of your posts go live within a similar time frame, you’ll give people the impression that you’re everywhere. Someone might read 3-4 different posts, each on different blogs and all of them be published by you. This helps to make you more memorable and coupled with stellar content that helps people – the impression you make could last for a long time. Did you know that the type of blog post you write can have a huge impact on how successful each of your guest posts are? Now, I won’t be talking about all of the typical types of posts such as list posts, how-to’s, opinion posts and tutorials, etc. What I am going to show you are the types of posts that are most often reserved for personal blogs, rather than for guest blogging. So, they have a lot of potential to drive shares, generate traffic, earn links and send new business your way. These are the posts that tug at your heart strings, and show you just what’s possible in this world. People love to be inspired, and when you share a truly inspirational story, you may find that you hit gold. 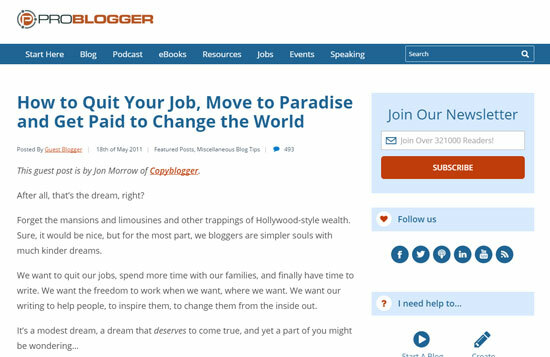 One of the best examples is Jon Morrow’s post on Problogger from 2011, entitled “How to Quit Your Job, Move to Paradise and Get Paid to Change the World”. This post has had over 15,000+ shares and has been seen by millions of people. Writing the most popular post on someone else’s blog earns you instant kudos. And making an impression like that with A-listers in your niche is critical. Then, other people will write about how you did it, just like how I am now. What if you could quickly put together a guest post while involving authority figures in your niche who’ll likely share it? Group interviews (or expert roundups) have become commonplace in the past few years because they have the potential to drive a lot of traffic. When you involve influencers directly in the content creation process, they’re partly invested in its success. And when people see themselves featured alongside other influencers, they’ll probably share the post. Most of these posts (including the ones I’ve published in the past), tend to feature 40+ people which makes it time-consuming. But when you limit these posts to less than 15 people, they become a lot quicker, and you end up doing a lot less writing. 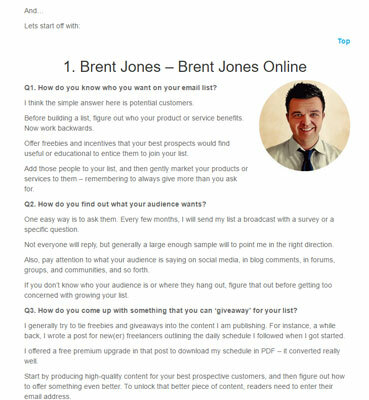 A good example is a guest post that Bill Acholla put together for UK Linkology on how to build an effective email list. What I love about this post is that Bill didn’t just ask 1 question, he asked a total of 7 questions. The finished post ended up being around 7,000 words or so and featured a lot of valuable insights. Traffic to that post was around 50% higher than average – that’s a win in my book. Infographics are highly shareable, and the information is typically much easier to digest than a regular post. And they can do a good job at earning backlinks with the right email outreach to get the word out. You’ll have a “linkable asset” on an authority blog in your niche that has the potential to drive traffic & subscribers back to your blog. 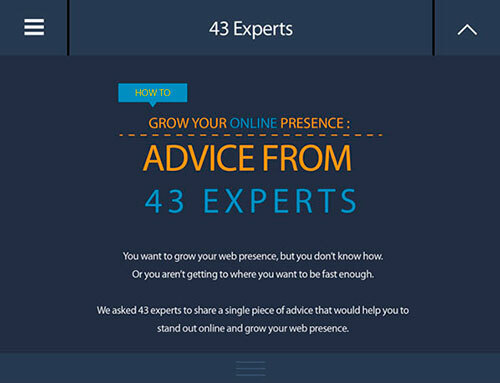 One of the most popular posts that I’ve published on another blog was an infographic for TweakYourBiz.com. This infographic received over 2,000 shares and has been seen by well over 30,000 people. The great thing about this is that you are getting more exposure without writing anything new. You’re just getting more mileage out of your existing content. Your blog is full of helpful posts, and they’d probably work well in other formats. It was a stroke of luck that I was able to get 24Slides to create this for free, but tools like Canva and Piktochart make it easy to create your own. They’ve both got some beautiful templates you can use. Pillar posts are those super in-depth blog posts that help bloggers make their mark. I’ve seen them called God posts and content anchors too, but the principal remains the same. These types of blog posts will drive the most traffic, earn the most links and gain the most shares. Although, there are usually exceptions. You may have seen those advanced guides on Quicksprout and Backlinko – they’re great examples of typical pillar posts. Even Mashable used to publish pillar posts back when they first got started. One of them was called “WordPress GOD” and featured a list of 300+ themes/tools/plugins. But when you publish a pillar post on someone else’s blog, you’re giving that post a great platform to gain huge visibility. I’ve had a lot of success with writing long-form content, but the reality is that if I’d published some of those posts on a blog with a larger audience than mine, they could have reached far more people. You’ll need to be careful about which blogs you contribute these types of posts to, because you would be giving someone your best stuff. 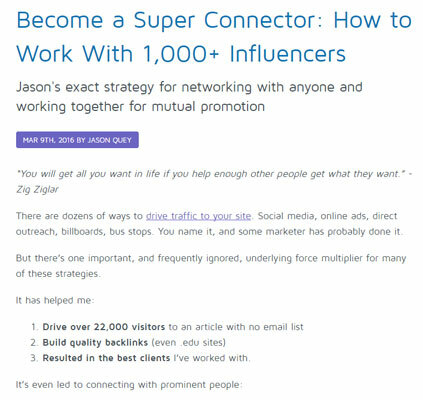 A great example is a post written by Jason Quey for the SumoMe blog, entitled “Become a Super Connector: How to Work With 1,000+ Influencers”. This was an incredibly detailed and insightful post, so I can only imagine how long it took to write. It generated over 1,500 shares and links from around 20 or so referring domains. The great thing here is that it’s one of those posts you have to come back to and read again. And it’s one that you’ll forward to a friend who has asked you about influencer marketing. Guest blogging is a big deal. And I’m not the only one that thinks so. According to GoodFirms’s SEO trends and tactics research, guest blogging is the second best link-building tactic used by SEO experts (the first tactic being producing link-worthy content). But now you know how to approach guest blogging, and you know the exact types of blog posts that will give you a competitive edge. When you build on the right foundation, and couple that with a clever strategy that has your end goals in mind, you’ll be far more likely to make guest blogging work for you. It’s essential to keep in mind that the benefits of guest blogging won’t take hold immediately – it takes time, determination, hard work and a lot of patience. Some posts will fall flat on their face, but it’s all about what you can learn about that failure to ensure the next one is a success. And it’s not a magic bullet traffic strategy either. The benefits go deeper than just driving more traffic. There are also the SEO benefits to consider as well.